an affirmation of beauty. When one tugs at a single thing in nature, he finds it attached to the rest of the world. I celebrated the start of Earth Day by spending a good part of the night outside on a cot bundled up against the 34 degree temperature. This year the celebration coincided with the Lyrid meteor showers and as an added bonus, the Northern Lights made an appearance. The hooting from a Great Horned Owl resonated through the still night air. Night time is time of rest and rejuvenation and for me nothing fills my soul more than connecting with the natural world around me. I didn’t take many photos last night because I wanted to just soak up the beauty of a clear night sky. We haven’t had many of those lately. This past week was filled with so many exhilarating moments. A lightning storm that sent hail cascading off of my metal roof in quantities that I have not seen before. Another halo event, not as vividly colorful as some of the others I have had the good fortune to observe but this one brought me another rare arc from my bucket list; a Wegener arc, named for scientist Alfred Wegener who first discovered it. Icing on top of the cake came in the form of confirmation and congratulations from renowned physicist Les Cowley of atoptics . 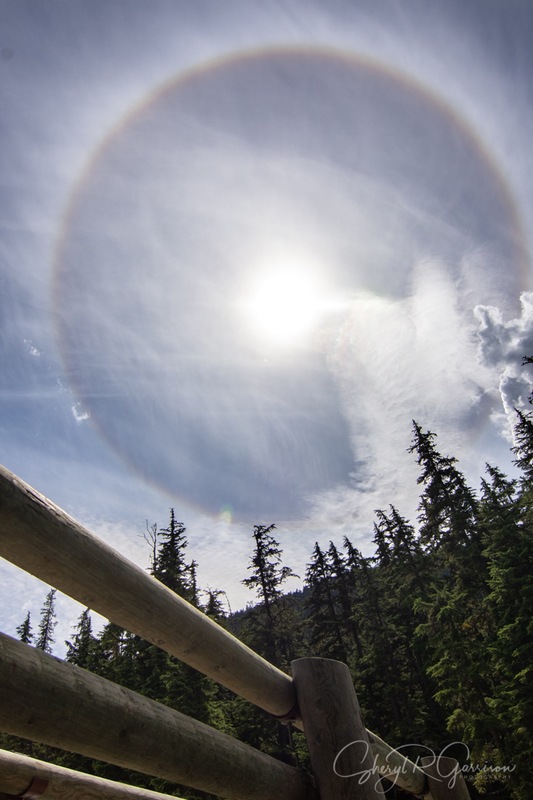 Also visible, 22 degree halo, circumscribed arc, and parhelic circle all created by ice crystals in cirrus clouds. I still recall a poster that I had when I was very young. It was a cloud chart. Celebrate Earth Day and take a few minutes to soak in some of the beauty of your natural world.